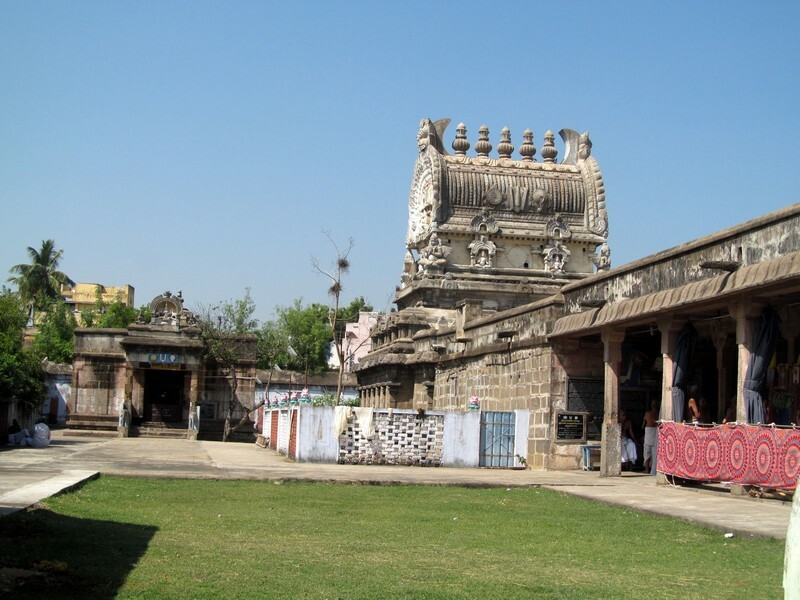 Sri Pandava Dhootha Perumal Temple is one of the 108 Divya Desams of Lord Vishnu situated in Kanchi. 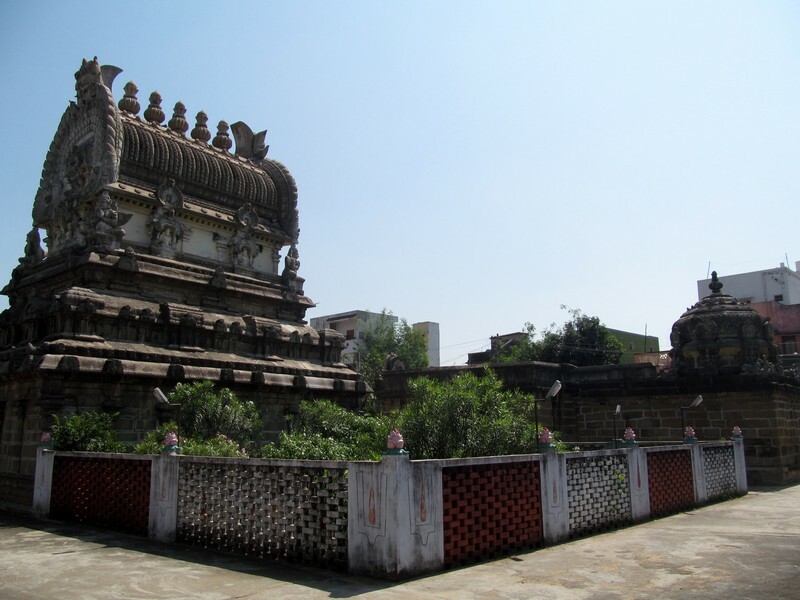 This is one of the oldest temples built during the chola Dynasty by King Kulothunga Chola I. The presidig deity of the temple Sri Pandava Dhoothar is in a huge form called Vishwaroopam of Lord Krishna. The 25 Ft idol of Lord Krishna is in sitting posture facing east. Lord Krishna is praised as Pandava Dhootha Perumal as He played envoy to Pandava brothers. He is mentioned as Dhoodha Hari in the epigraphs here. He also granted vision and darshan to blind king Dritharashtra in this place. 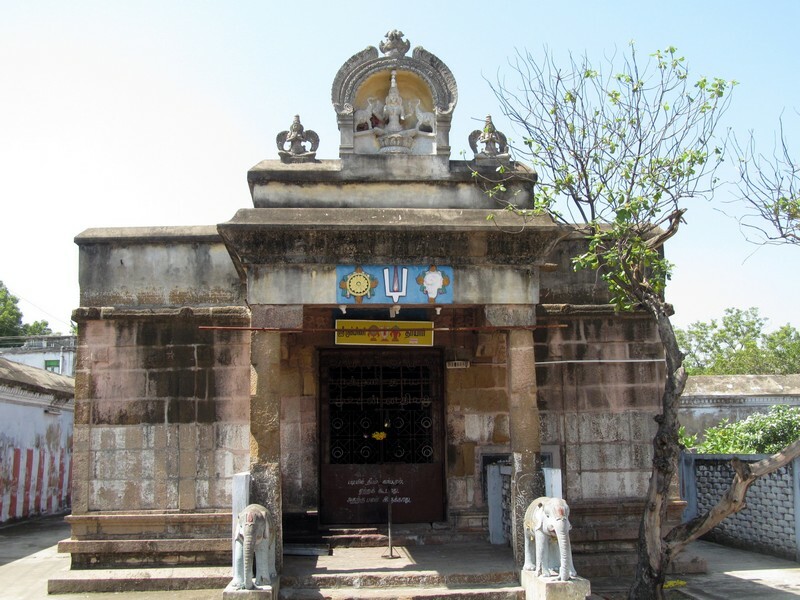 Vaishnavite Acharya Arulala Perumal Emperumanar, also called Yajnamurthy visited here, held a debate with Sri Ramanuja and surrendered to him after 18 days. Acharya Manavala Mamunigal also had visited this place. Rohini Devi worshipped Lord Krishna here and had the hands of Moon-Chandra in marriage here. Of the 27 star Devis, Moon wedded Rohini with Jnana Sakthi (wisdom powers) followed by Kruthika with Agni powers. He married other Devis later. It is said that Rohini is still worshipping Lord Krishna formlessly who granted wisdom powers to her. In order to make peace with the Kauravas, Krishna goes to Hastinapura to the court of Duryodhana on behalf of the Pandavas. With a plot to kill Krishna and thus to put all hopes of a peace treaty, Duryodhana digs a pit and tops it with bamboo sticks. On this bamboo topped pit, he puts up a grand stage, thus setting up Krishna for a mega fall. Once he enters the hall, the all knowing Krishna presses the stage with his little toe to send it crushing below. And immediately after, Krishna displays his Vishwaroopam to the blind Dhirdharashtra (and only to him), by giving him the vision. Years after this episode, Arjuna’s Grandson Janmejaya, who listened to the Mahabharata story from Vaisampaayana wanted to relive the moment (that of Lord Krishna displaying his Vishwaroopam) and undertook penance at this place. Krishna is believed to have provided Darshan to Janmejaya, as ‘Pandava Dhootha’, in the same way he had in the Mahabharatha episode. Having played the role of a messenger for the Pandavas, Krishna, here at this temple, is known by that same name - Pandava Dhootha Perumal. Four Azhvaars in their 6 Paasurams have praised the Lord her. 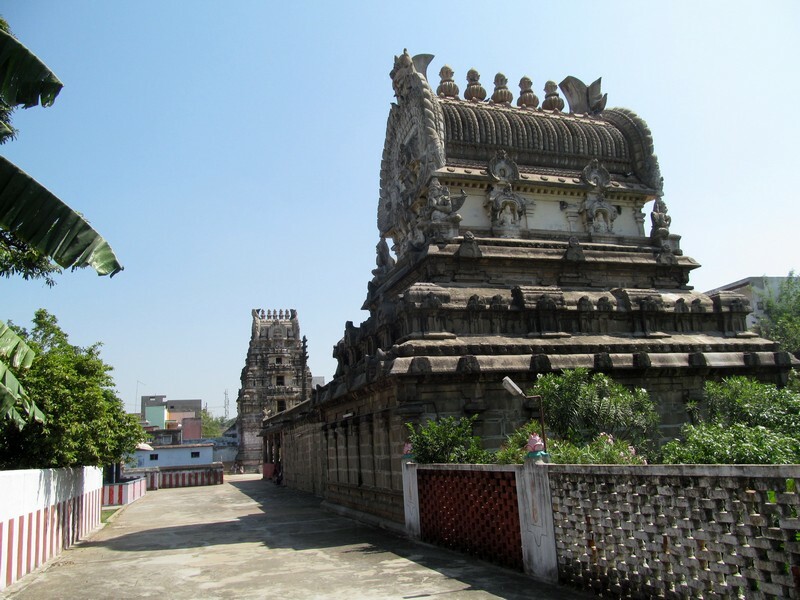 Thirumazhisai Azhvaar refers to 3 temples in Kanchipuram as representative of the 3 postures of Lord Vishnu. Among the Divya Desams, this temple (ThiruPaadagam) was just referred to as ‘ Lord in Sitting Posture in those days, while ThiruOorgam was referred to the Lord in standing posture and thiruVekka as the Lord in Sleeping Posture. It was only later that other Azhvaars referred to Lord Vishnu and his 3 postures. Just in the way Krishna protected the Pandavas, it is believed that the Lord here will protect devotees who pray with sincerity and unflinching devotion. There is said to have been a 18 day debate between Ramanuja and a Saivite Scholar. 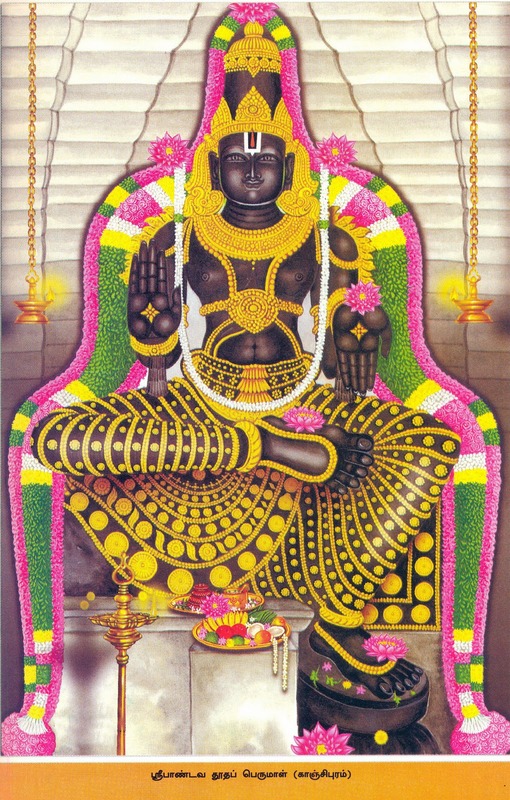 Having lost the debate to Ramanuja, the Saivite Scholar is said to have become his discipline and changed his name to Arulaala Perumal Emberumaanar. His descendents are the ones currently managing the temple. Lord Krishna is pressing His feet here with his Viswapada Yoga powers. Hence those doing Adi Pradikshina, Anga Pradikshina will have their 72,000 veins energized and help them overcome any problems in life. It is advised that devotees pray here on Wednesdays, Saturdays, Rohini Star days, Ashtami the eight day from new moon or full moon days and on the 8th of each month. It is the staunch belief that those born in Rohini star will be relieved of any hardship in life if they pray to Lord Krishna in this temple. 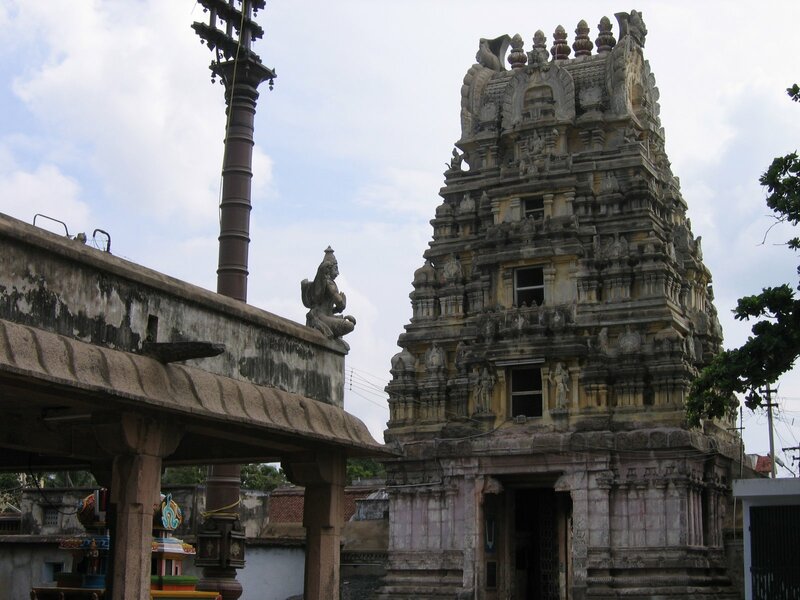 The tower above Lord Krishna – Pandava Dhoodha Perumal – is called Badra Vimana. Festival: Sri Krishna Jayanthi in August-September; Deepavali in October-November; Mukkotti Ekadasi; Panguni Uthiram in March-April; Sattrumarai Utsav for Arulala Perumal Emperumanar on Karthikai Bharani star day in November-December are the festivals celebrated in the temple. The temple is open from 07:00 a.m. to 11:00 a.m. and from 04:00 p.m. to 07:30 p.m.
3 kms from Bus Stand. The temple is opposite that of Lord Ekambareswarar in Kancheepuram.